On 11th November, 2018 the United Kingdom and its friends overseas will mark the day 100 years ago when the guns fell silent at the end of the First World War. At 7pm after darkness has fallen more than 1000 Beacons of Light will be lit all over the country. Billericay will be part of this tribute. Starting at 6.15pm by the Beacon at Sun Corner there will be music from High Voltage Brass Big Band, followed by a procession from the Air Cadets. The programme will follow a similar format to those happening all over the country and culminating in the Lighting of the Beacon at 7pm. 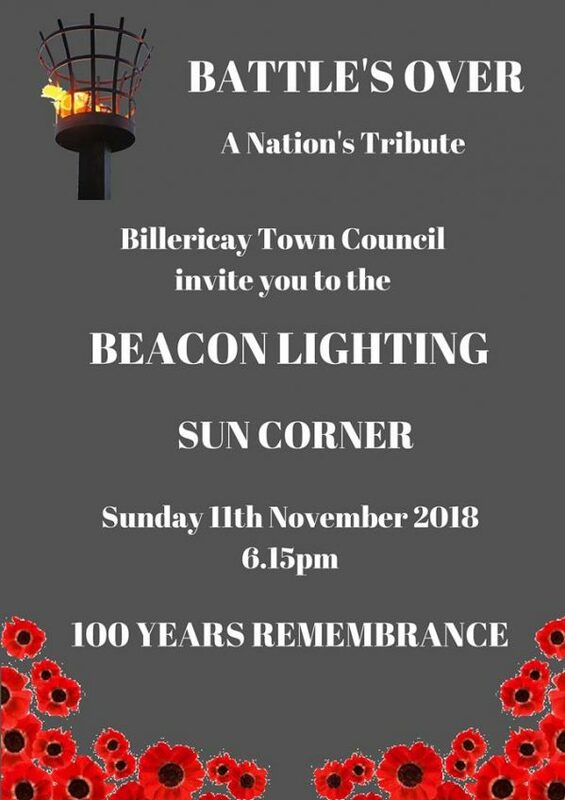 Come along and join in for this historical event at Sun Corner at 6.15pm to support the town’s tribute to the centenary. Residents are also asked to join in by bringing along a torch to be switched on at the same time that the Beacon is lit at 7pm.